Billerica Town Hall is located at 365 Boston Road, Billerica, MA 01821; phone: 978-671-0942. Photo: Deacon Samuel Hill House, ca. 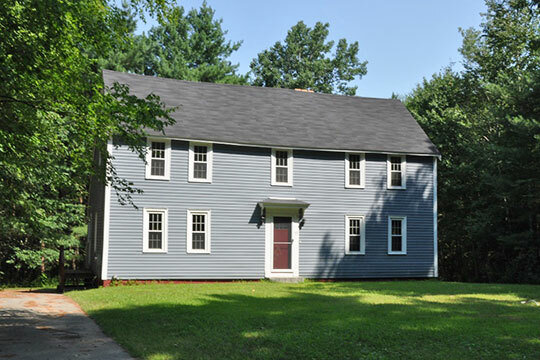 1725, 33 Riverhurst Road, Billerica, MA. Listed on the National Register of Historic Places in 1990. Photographed by User:Magicpiano (own work), 2010, [cc-by-3.0 (creativecommons.org/licenses/by/3.0)], via Wikimedia Commons, accessed August, 2014. The town, originally part of Cambridge, was founded in 1655 by several families moving here from nearby Woburn. At that time a strip of land was set aside as a Common forever, of which the surviving Common is but a small part. In 1658, 25 families lived here. In 1660 the first meeting house was built at the southeast end of the Common. The original settlement buildings were clustered around the meeting house on the Common as a means of protection from the hostile environment. In 1707, the original 10 acre Common was pared to its present 2 acres when the town's second minister, Samuel Ruggles, received the bulk of the Common land next to the meeting house in a town grant. The second (1694) and third (1738) meeting houses continued to occupy the same location as the first, next to Reverend Ruggles' lot. The site remained the most important in the town through the 18th century. It served its religious purposes and also as a town meeting center until a town hall was built in 1798. Alexander Cassie, consultant for Elizabeth R. Amadon, State Survey Director, Massachusetts Historical Commission, Billerica Town Common District, nomination document, 1973, National Park Service, National Register of Historic Places, Washington, D.C.